The cost of a buying a conservatory for your home is clearly going to be dictated by 2 main factors, namely the style and the size. So when you ask "how much does a conservatory cost?" you will find that the bigger and more fancy the room you want, the more you are likely to pay to have it installed. Up-front conservatory costs are not the only thing to consider, don’t forget you may need to do interior finshings such as lighting, heating, décor & furnishing or blinds & curtains – all these things add to the final price. Which is why an "instant online quote" can give you only part of the total cost of getting that new home extension finished and ready to enjoy. There are some things to consider for this answer, the type of material the conservatory is built from and the style of the conservatory itself. Materials - The most common materials used in the construction of conservatories would be uPVC, Hardwood, Engineered Wood or Aluminium. Out of these materials, uPVC is most likely to offer the lowest installation price and ongoing maintenance costs. Labour costs - instant online quotes do not take into account difficult or abnormal site condititons. Labour cost on this aspect alone can vary greatly. Get a survey & written quote. Style - Popular styles include Lean-to and Victorian Conservatories. You can see what the most popular conservatory styles are on this page. One really good thing to remember is that, according to many reputable sources, building a conservatory on your property can actually add value to the house - it's estimated that this figure could be as much as 10% added to the resale value. With the average house price in the UK at just over £217,000 this year, a new conservatory could put more than £20,000 on the value of your house. Orangery or Bespoke conservatories, as you might expect, are at the upper end of the prices range as they would tend to be larger and more complex designs that are built to order. Having said that, even adding features like dwarf walls or any type of masonry to a small conservatory will drive up the end cost. Some extra's or features that can impact pricing. Size - do you need planning permission? Access - is it difficult for builders to get materials in and out? You also have to take into account the ground you are building on. If the ground is good, you may need a less substantial base or foundation. But if the ground is bad, then the cost of the foundations can increase. Therefore the final prices is also dependent upon what you do with the foundations of the conservatory. One option that can be used in many types of ground, and useful where there are a lot of utility pipes / cables or drains on site, is to install a pre-fabricated steel base. These are raised galvanised steel frames that sit on plinths and avoid the need to dig traditional trench footings. A standard small steel conservatory base price will be around £1,500. In order to give yourself the best chances of finding a really good deal, don't be reluctant to shop around by getting written quotes from a number of different companies - try to select installers that have recognised trade accreditation from GGF / FENSA / CERTASS or DGCOS and then negotiate for a price that is the best that is on offer with the installers of your choice. More often than not, lean to conservatories are rectangular in shape (sometimes square) with the longest side against the house and a single plane, angled, sloping roof. Known for their versatility, a lean-to can be fitted almost anywhere, in small or larger spaces. Because they are not that complicated in design there are many low-cost or budget lean-to conservatories on the market. Some of the more popular options for Lean to conservatories are to have full glass sides or to include low height brick or block-work knows as “Dwarf Walls”. You can also have “half-glazed” where the bottom half of the glazing is replaced with infill panels (typically uPVC). Roofing can be fully double glazed or make use of a lower cost option such as polycarbonate panels. Whilst Poly-carbonate panels are not as good as a double glazed roof, you can get them in tinted colours such as Opal or Bronze that do go some way to help reduce sun glare. Using French doors & sliding patio doors is commonplace, but if you have the room to do so (and the budget) a full width set of Bifold doors can look amazing. What is a Lean-to Veranda Conservatory? This is not really a conservatory style of its' own, but more of a development of a specialised feature where the external roof line is extended (on the door side of the room) to create a protected area - much like an awning over a window. How much do lean to conservatories cost? There are 2 aspects to this – Labour & Materials. So some prices may show supply only, others will give a general idea of what the price range may be for supply & fit. To substitute Poly-carbonate roof sections with double glazed units you should add from £500 to £1,000 to the cost (depending on the size of your conservatory). Also sometimes referred to as one of the "Period Conservatory Styles", a Victorian Conservatory is characterised by the effective use of faceted sides (like a bay window). Smaller examples will have 3 facets, larger can be found with 5 facets. Featuring ornate paneled roofing with a traditional "sun-room" feel about them, Victorian conservatories are considered an elegant style. Options for Victorian conservatories are for full glass sides and many make good use of low level “Dwarf Walling”. You can also have the sides “half-glazed” using uPVC panels to infill in place of glazed sections. Roofing of the room is typically double glazing or polycarbonate panels, but there is a current trend towards sold roofing. This option allows for fully tiled / slated roofing or even the use of composite panels. Using French doors is very popular in a Victorian conservatory, as they open outwards and therefore do not interfere with internal space. To substitute Poly-carbonate roof sections with double glazed units you should add from £750 to £1,500 to the cost (depending on the size of your conservatory). What is an Edwardian or Georgian Conservatory? Also one of the "Period Conservatory Styles", Georgian or Edwardian Conservatories are square or rectangular in shape and work best as a medium or large conservatories. The Edwardian & Georgian Conservatory Styles are very similar, and from a distance it is very difficult to spot the differences as they both share so many of the same features. Edwardian & Georgian style rooms have high roof-lines, known as vaulted or hipped roofing, which can be quite ornamental with detailed ridges and guttering. The flat sides and rectangular shape make them quite easy to furnish, as unlike a Victorian design they have no facets or "curved" floor-plan. Both of these conservatories can be installed with fully glazed sides, but look much better with Dwarf Walls - they add to the character and make the room appear more as part of the original home rather that something just "stuck on as an afterthought". As with other designs, you could opt for having the sides “half-glazed” in place of brick-work at low level, but I'n not quite sure this option works well with this style of room. Similarly to a Victorian style, Edwardian & Georgian conservatories look good with French doors and this double door feature is the most popular choice. How much do Georgian & Edwardian conservatories cost? To substitute Poly-carbonate roof sections with double glazed units you should add from £1.000 to £2,000 to the cost (depending on the size of your conservatory). Bespoke conservatories would be those rooms that are variations on the preceding popular designs - but separate and different to Orangeries. But really speaking, Bespoke just means the room has been specially tailored to your particular needs. The most frequent use of a bespoke conservatory would be for rooms such as the P-shape, T-shape or L-shape conservatory. L-shape is commonly where a lean-to conservatory "wraps around" a corner of the property. 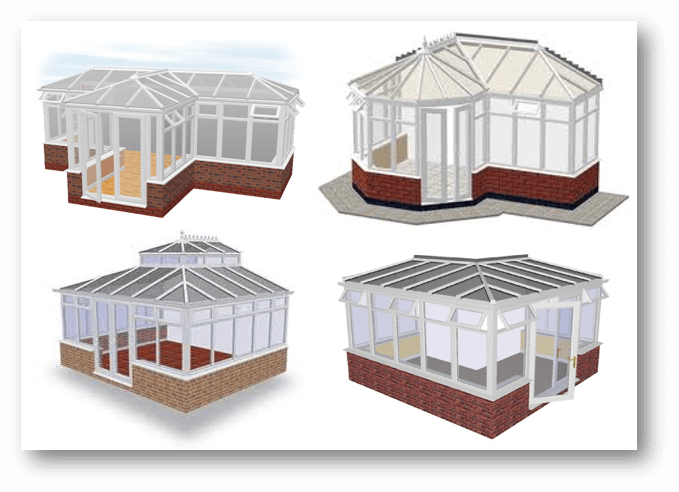 Other bespoke options could be to use something like a "gull wing lean-to conservatory"
As bespoke conservatories are built to order on the basis of your requirements, then it means that you can have whatever options that the design parameters, or your budget, can cope with. How much do Bespoke conservatories cost? 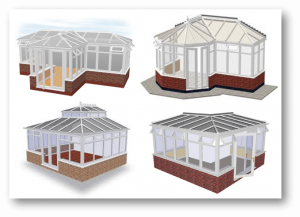 What about Planning Permission for a Conservatory? The requirements for, and the cost of, planning permission for a conservatory need to be considered at the very early stages of your project. The reason for this is to make sure that you either do, or do not need prior planning permission to build your conservatory. If you build a conservatory without planning permission and you should have had it, then you may be able to apply retrospectively (afterwards) but this process is fraught with problems and difficulties. But you could easily end up being ordered to remove the construction completely - and that is going to cost a lot of time, trouble, stress and heavy expenses. There are some definite cases, irrespective of the size of the proposed project, where you will need permission to build before you start work. If you live in a listed property. If you live in an area of Outstanding Natural Beauty (AONB). If there is some kind of restrictive covenant on your title deeds. 1How do I get conservatory quotes? Simply send us a few details about your project and we arrange for trusted installers to provide you with quotes direct. Yes - all quotes provided from our panel of installers are free and without obligation to buy anything. 3Can I get multiple quotes? 1What size is a small conservatory? To be a comfortable living space you would want your room to be at least 3.0 metres wide by 1.5 metres deep (about 10 feet by 6 feet). 2What type of doors can I have in my conservatory? You could fit any type of doors that you like. But in reality, you should consider how well the door suits your room. For small conservatories, French Doors are good because they open out. Bifold doors look really good on a wide fronted conservatory. 3What type of conservatory roof can I have? The lowest cost option is likely to be Poly-carbonate panels, but they can be noisy in the rain. Double Glazed conservatory roofs are better performing than poly-carbonate, but more expensive. You can get self-cleaning glass for the roof which is a big help. Tiled roofs using concrete tiles or slate are becoming very popular, as is the use of lightweight synthetic tiling systems. 5Can I have a 2 sided conservatory? Lots of times where the room is being built in a corner spot, there are exiting walls. If you have a situation like this, then it is possible. You should check the existing walls are suitable, especially to take the weight of the new roof and to avoid damp and heat transfer. It is probably best to look at a design that has a low roofline profile - such as a Lean-to. Have an installer over to look at the property and advise you on an appropriate solution. Yes you do. All installers will provide a "workmanship warranty". Absolutely clarify in writing with your installer what is covered beforehand. The components of the conservatory itself should carry a guarantee. In the early stages, the installer should provide an insurance backed guarantee to secure your deposit. 9Is underfloor heating best fitted during or after construction? There are 2 types of underfloor heating. Wet systems are best fitted during construction as they will raise the floor level by a couple of inches if fitted afterward. Dry systems can also be fitted during construction and do not raise the floor level so much if fitted afterward. 10Can I get roof blinds for my conservatory? Yes you can - aftermarket options are plentiful and not too expensive. You could have them built into sealed double glazed units, but that would be more expensive. Within certain parameters, "permitted development" status is granted to a vast majority of conservatories in England & Wales, and so planning permission is not then needed. Before you do anything, it is essential to know what is buried underneath your proposed room. Storm drains, foul drains, electricity cables or gas pipes could be lurking there unseen, just waiting for you to damage them. Manholes will need to be moved. 1Should I take a loan to pay for my conservatory? This is a touchy subject, and we are not financial experts to offer advice on personal finance. But common sense dictates that you only borrow money if you are absolutely sure that you can pay it back. Many double glazing companies offer financing to buy their conservatories, but if you are thinking about borrowing money to do a home improvement, it could be a good idea to talk to your mortgage provider first (if you have one) or your own bank. 2Should I deal with an unregistered installer? The simple answer is no - if the company offering to do the work is not a member of a recognised industry trade body, then you have to ask yourself the question "why not?" 3How much of a deposit should I give when buying? The amount of deposit you will be asked to give, once you have agreed to a contract for a major home improvement, will inevitable vary from contractor to contractor. It may also be influenced by the overall cost of the work. For a small job, you may be asked for only 10% to 20%. But for something costing several thousands of pounds the percentage could be much higher. 4Will my deposit be protected? If you are ordering home improvements that cost a lot of money, do not deal with a contractor who cannot provide a rock solid deposit guarantee.